Having trouble identifying your hot dogs? You might need to brush up your knowledge of basic American cuisine, but if you’re in a rush, there’s now – amazingly – an app for that. And you can thank the HBO hit series Silicon Valley for the idea. If you’re an avid viewer of the show, you know all about the trials and tribulations of struggling entrepreneur Erlich Bachman, who, in season 4, is trying to capitalize off an app containing nothing but a handful of octopus recipes made by an amateur developer named Jian-Yang. At first, no one – rightly – wants to invest in an app that offers a grand total of eight recipes using octopus, but Bachman, in a last-ditch attempt to save himself from humiliation and hopefully make some money in the process, spins the app as one that can “see food,” rather one that merely provides users with a limited number of seafood recipes. He blames the confusion on Jian-Yang’s poor grasp of English and the app gets its funding. But any hopes that the app will become the “Shazam of food” are quickly dashed when it turns out that the only food the app can identify is a hot dog – and thus the Not Hotdog app was born. Not Hotdog is actually available to download from the Apple app store. 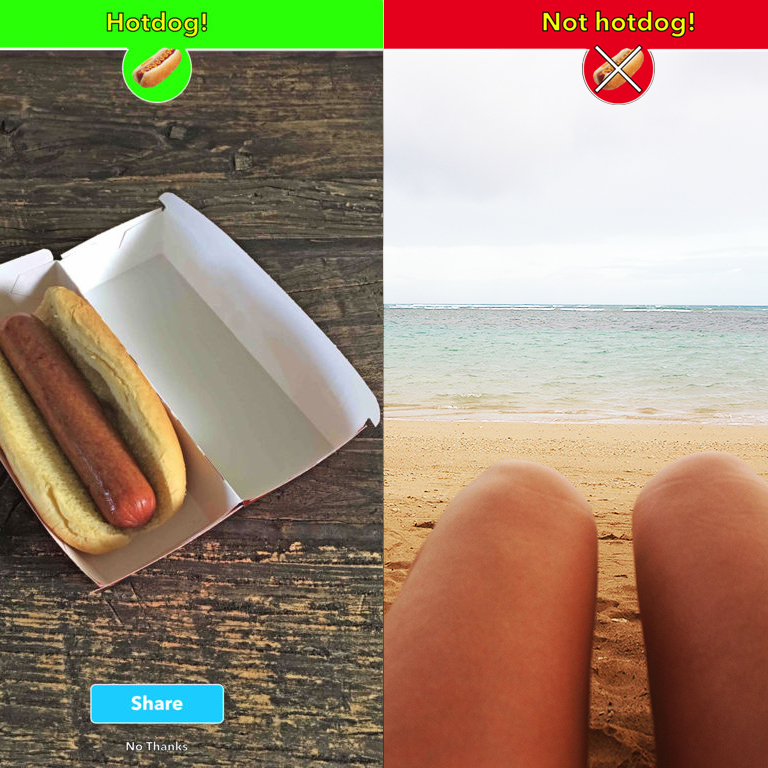 The app uses your phone’s camera to determine if your food – or any other object, really – is a hot dog or not. And it actually works. The app’s fictional creator, Jian-Yang, even did a faux-interview with Bloomberg on the app’s success, following it’s “sale” to Periscope. Okay, so maybe it’s not the most useful app out there on the market, but it does make for some pretty hilarious twitter fodder. Perhaps it's best use is to identify hot dog legs. Too bad it doesn't answer an even more pressing question: Is a hot dog a sandwich?